What is Bingo's middle name? George played Raunchy for John and Paul supposedly on a double decker bus, what what vehicle were they actually on? What George's song is the prequel to Taxman ? He almost co-wrote a protest song with Ron Nasty called "Raise Taxes On Those Rich Capitalist Barstewards Already!" but abandoned the effort ten minutes after his first big Beatles payday. How did America react when John proclaimed "We're more popular than pizzas right now"? They accidentally burnt their pizzas in the oven instead of their records. Which Beatle spoke 12 languages? Why did George's and John's dentist give them LSD? What was George's chat-up line to Pattie Boyd? but George and Pattie are my favourite Beatle couple, so I couldn't resist answering this question! What is the plot to Let It Be 2? "I have a huge guitar in my case, want to see it later?" It wasn't much of a plot. Basically just footage of the Beatles and Yoko watching a private screening of 'Let It Be '. There was one awkward scene however, involving a slight row between George and Paul. George could be overheard saying, "If you want butter on your popcorn, I'll give it to you, or if you don't want butter, I won't. Whatever topping on your popcorn that pleases you, I'll get.". It went downhill from there. What was Ringo doing during the infamous "popcorn" scene? He was doing the Popcorn! Why didn't George Martin let Ringo play drums on the LMD single? His horoscope told him to 'beware of the rings' so George Martin, filled with fear, arranged Andy White instead. However, it became apparent later, that the rings, George Martin should beware of, were no rings one wears at one's finger but instead referring to telephone calls because he had forgotten to pay his rent and a very angry landlord phoned him a few days after the recording session. What did Paul's father say to Paul, after he had heard She Loves You for the first time, concerning the repeated usage of the word 'yes'? What were the lyrics to the resulting Jim & Paul McCartney collaborative rewrite? , No, No, No, Nooooooh! 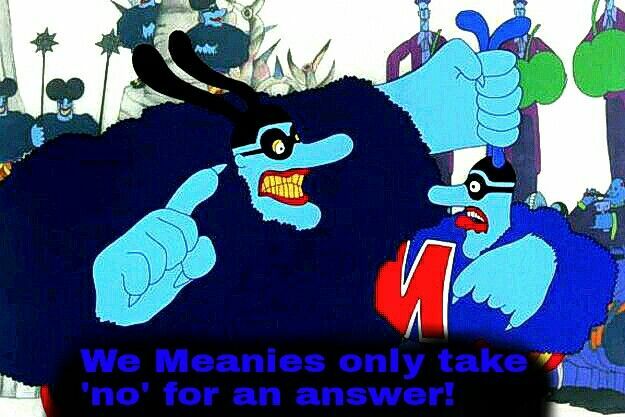 Note: A blue meanie suggested to Ringo to do the No No Song a decade later. In Rishikesh, how did Mike Love and Donovan prank The Beatles? 'She Thinks You're The Bees Knees, Daddio'. The influence of Jim Mac's Jazz Band was undeniable. 'It Won't Be Long ' was influenced by what or by whom? What can you hear if you play Getting Better backwards? You can hear it getting worse, obviously. 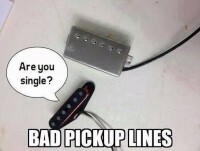 What was George's other pickup line to Pattie? I'm in a band with Paul McCartney . What drawing by Julian led to John writing a song? What was the name and theme of the song? haha I was hoping someone would envision George telling Pattie "No kidding, luv, I can introduce you to Eric Clapton!"